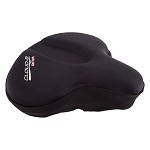 The Contour Gel Pad offers 1 1/4'' worth of additional gel padding for our Contour Seat. 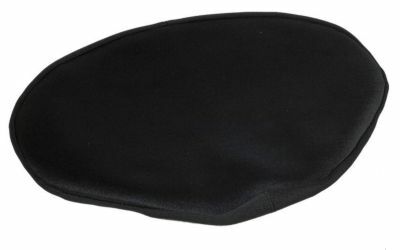 Additionally, this gel seat cover will fit most saddles that measure 14''-16'' wide and 10'' - 12'' long. Nice tight fit on the seat. I used to be hurting by 20 minutes. Now I can go and hour or more with no pain. Great product. This seat cover was purchased as a birthday present for a friend who had just bought a 3-wheeled bike. He likes the seat cover and put it on his bike immediately and says it greatly help his comfort and also helps him not to slip on the seat. This gel cover was exactly what my brother wanted. It has made riding his bike a lot easier. Exactly what I needed! Fits the tractor seat perfectly and softens the edges for the inner thighs. Went on a 20 mile ride after getting it and was totally comfortable the whole ride! Fit the saddle seat perfect and was well worth paying a little extra for the softer ride . I highly recommend it. I'm very pleased with the construction of the cover. It fits like a glove. I did push in some padding between the seat and cover to increase the thickness. I am very pleased. 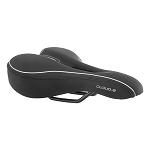 i was hoping for a generously padded seat which would extend the time i could ride my recumbant bike comfortably. This seat is only lightly padded, only extends my riding time without seat bone pain by 10 minutes, not what I was hoping for. Although I ended up returning the tractor style seat that this pad fits because it was uncomfortable, I kept this gel pad. I placed it over the original seat, added a 2 X 12" piece of wood across the back and accomplished a comfortable seat for my exercycle.